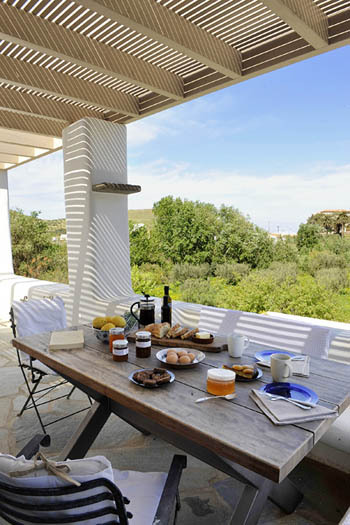 The Red Tractor Farm is a unique little holidays hide-away on the island of Kea. 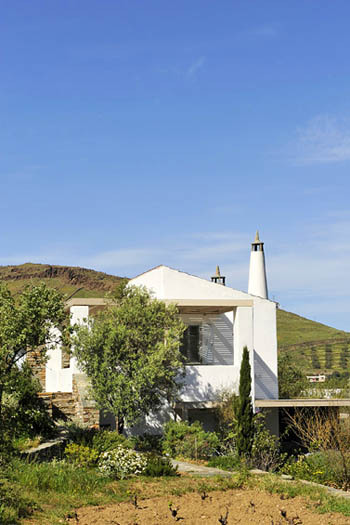 It is an old 7-acre family property with charming self-catering cottages surrounded by vineyards and olive groves, set in the hilly landscape only a few-minute stroll from the beach and the port. 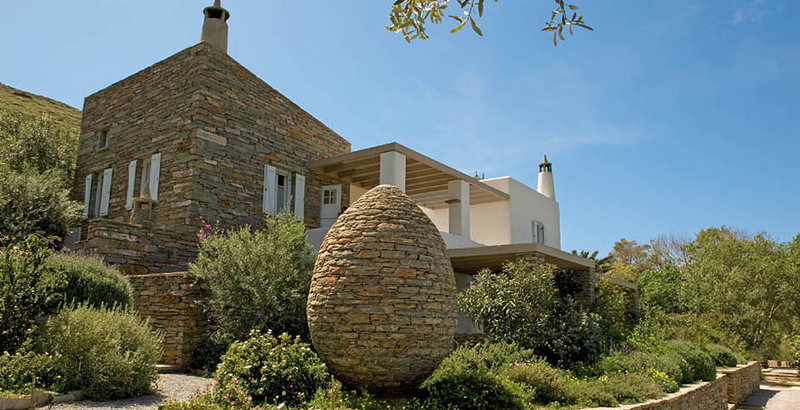 Kostis and Marcie grow fruits and veggies; they produce wine, olive oil, marmalade and fruit preserves, all organic, as well as acorn flour, which they make from the nuts of local oak trees collected by islanders and volunteers. It was new to me, but apparently it’s really healthy and Marcie’s acorn cookies are indeed delicious! 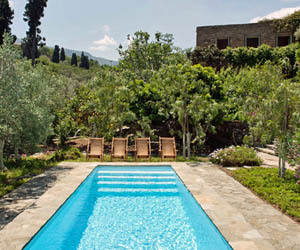 Guests can choose between eight tastefully decorated double rooms and studios overlooking the green hills and olive groves. 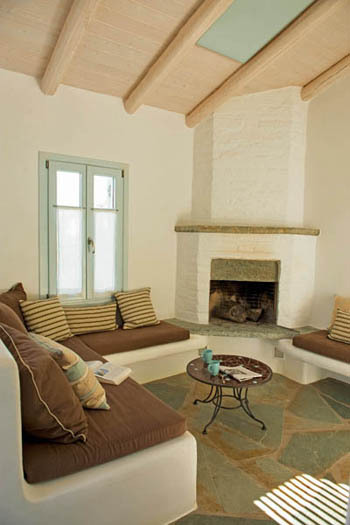 They are done in a Cycladic style with light blue shutters, whitewashed walls and built-in furniture, but with some earthy colours too. The accommodation is cleverly designed so the rooms and studios all have full privacy both inside and out (each unit has its own little garden) while they can also easily interconnect to accommodate families or groups. 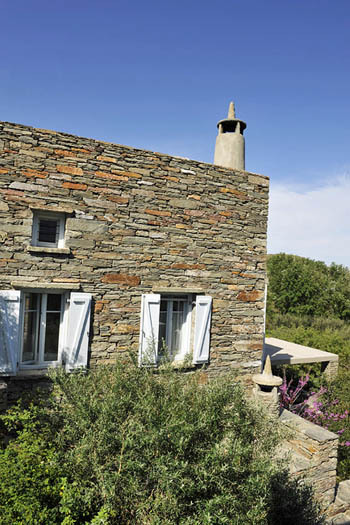 There are some arty touches in the décor; beds are comfy; bathrooms are good and the studios have little kitchenettes to prepare breakfast or light meals from local produce. 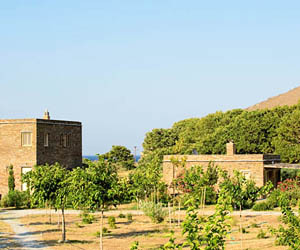 While the cottages are only a stone's throw away from the beach, the actual sea view is blocked by trees and greenery. 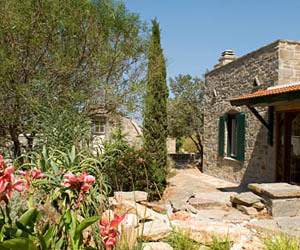 1 cottage with a studio for two persons (and one child up to the age of ten) and a double room. 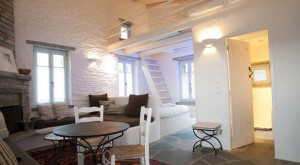 1 cottage with a studio for two persons (and one child up to the age of ten) and 2 double rooms. 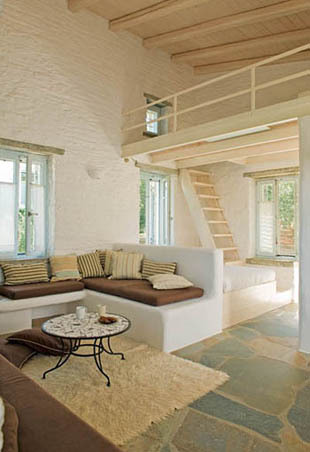 The first three cottages have a studio at the upper level, and one or two double rooms on the level below. Families or groups can book cottages as a whole, but the rooms and studios can also be booked individually. 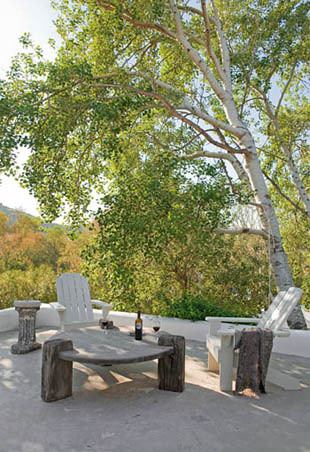 Each room and studio has its own terrace and private entrance. 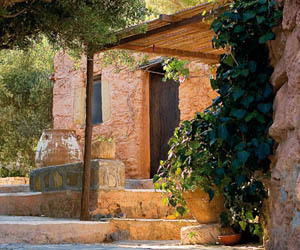 Prices for two persons from 70 Euro per night, taxes included. 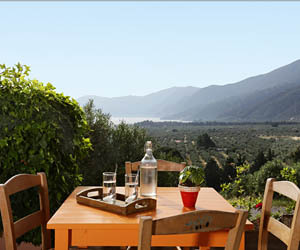 For a full overview of room rates, please check the website of the Red Tractor Farm or contact Marcie. 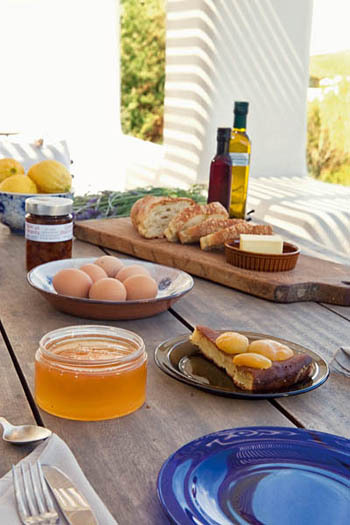 Marcie doesn’t serve breakfast but usually offers some of her own jams and cookies to her guests, and you can make yourself breakfast in your cottage. 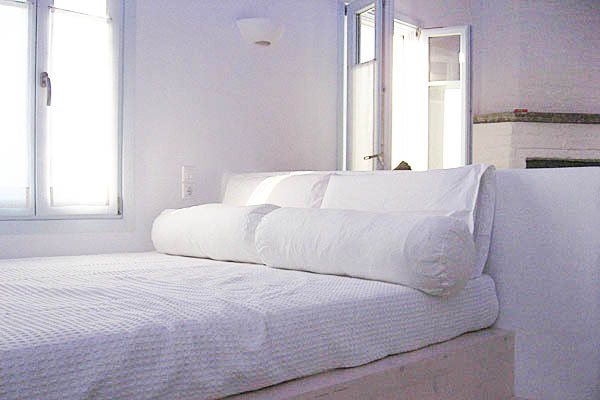 It is only a few minutes’ walk to the seafront of Korissia, where you can shop and where you will also find places to have breakfast and your other meals if you are not in the mood to cook. 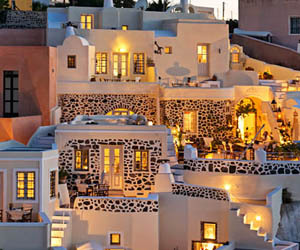 There are some charming seaside Greek restaurants and tavernas. 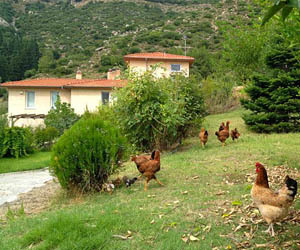 The Red Tractor Farm is a wonderful place for holidays with children. 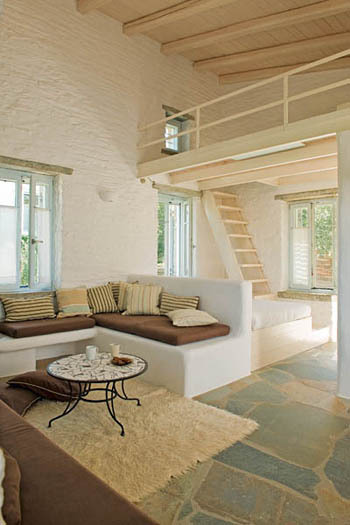 The cottages are cleverly laid out and can easily accommodate families. 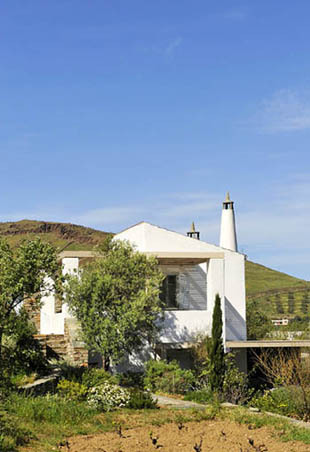 The largest, “Vineyard Guesthouse”, can sleep up to seven persons. 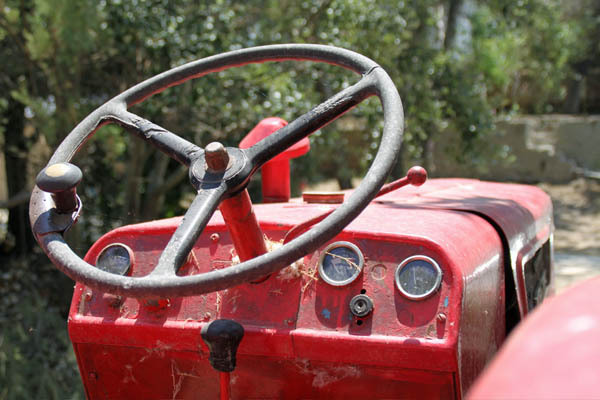 I think the Red Tractor Farm is great for holidays with children of all ages. Your little ones will enjoy playing in the gardens, while older kids and teenagers can easily walk to the beach and the port by themselves to have fun. The only thing you should keep in mind if you travel with toddlers, is that the cottages are multi-level, so there are stairs, and some of the beds are on mezzanine levels. Baby cots are available. 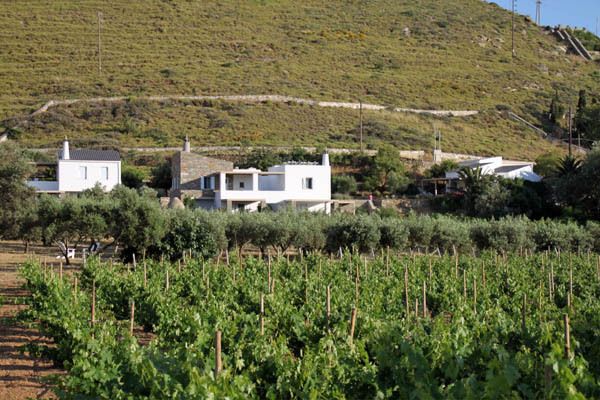 The Red Tractor Farm is situated only 200 metres from the beach of Korissia (the main seaside village of Kea (or Tzia, as the locals tend to call the island), where the ferries arrive), but the setting actually has a more rural village, and the houses look out over the hills. It is very quiet, and yet, several cafés, small shops and restaurants are only a short stroll away. 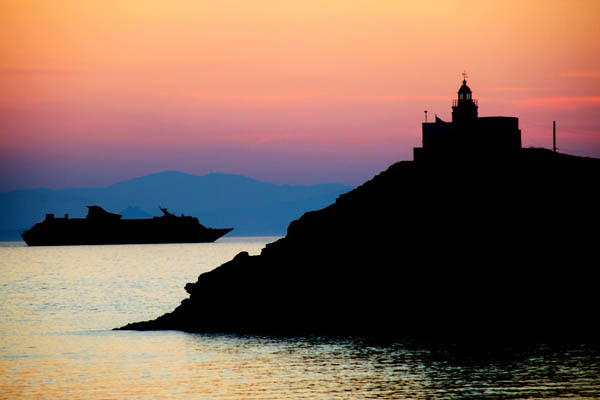 To get to Kea (Tzia) it only takes one hour by ferry from Lavrio (which is half an hour’s drive from the airport). There are usually one or two ferries a day. 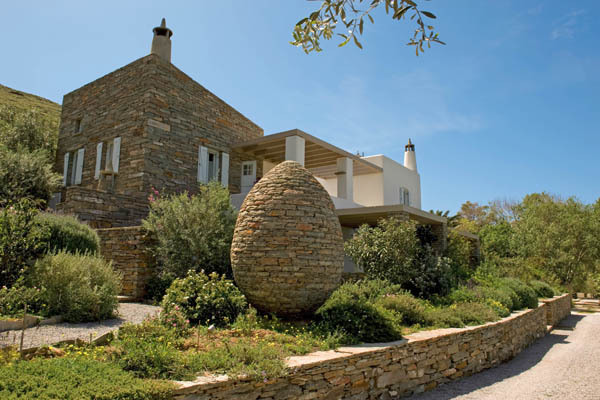 The farm is about 10 minutes’ walk from where the ferry arrives (the driveway starts at the far end of the beach), but you will be picked up by Kostis or Marcie so you don’t have to carry your luggage. I went to Kea and what a match! It was easy to hire a car at the airport, easy to find Lavrio and it was smart to bring the car with. Red Tractor Farm was just right for me. Marcie was very busy with the acorn collecting, so I barely met her. But Kostis was there and he was also very kind! They upgraded my room to a studio and I felt like I was living in a sort of simple luxury! Kostis showed me a lot of tracks around the island, and I was exploring every day. No tourists, lovely water to swim in, and a lot of nice people. All in all this was a fantastic good advice you gave me. Thanks a lot again and I have really had a nice time. I would love to go again. Soon.